Posted on August 1, 2018 August 1, 2018 by Meghan Barlow, Ph.D.
Those are the typical responses to anxiety that most people have. When your child feels anxious, you may notice that your normally very rational child seems to become possessed, yelling and screaming and acting hysterical. Other children seem to dig in their heels and just not move. 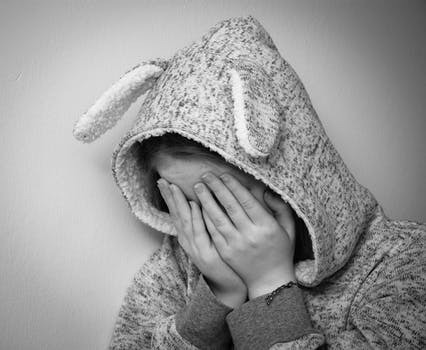 In general, children who are anxious are probably trying to escape a situation that is triggering their anxiety, or they are trying to avoid facing a situation that may cause anxiety. Escaping and avoiding temporarily relieves the uncomfortable feeling that comes with anxiety, but ends up actually strengthening the anxiety over time. In treating anxiety, it is essential to help children face and get through those moments when they feel uncomfortable. In this, they learn that the uncomfortable feeling they experienced will go away, and that what they originally feared was not so scary after all. For example, if a child is scared of bees, they may want to avoid being around bees by staying inside, or they may run inside if they see a bee outside. Every time the child avoids or escapes being around a bee, they are actually strengthening their fear of bees. Encouraging a child to stay outside (and stay still and breathe) when they see a bee, helps them to learn that even though they may feel uncomfortable when the bee is buzzing around, it is a temporary feeling and it will go away. It’s an easy process to understand in theory, but in practice can be pretty hard to see our child through. When our children are knee deep into their fight, flight, or freeze response, they are clearly suffering. It is hard to see our them go through this. And sometimes helping them actually feels kind of heartless. Employing the following strategies can make the process for you, and your child, a little better. It can feel particularly heartless to not give in to your child’s pleas to help them escape from an uncomfortable situation in front of an audience. If the school nurse calls informing you of your child’s stomach ache and you’re pretty sure it’s anxiety related, you may be thinking, “I don’t want to pick her up and give in to the anxiety, but I don’t want the nurse to think I’m a bad mom.” Your child will not likely be able to remember and stick to the plan you made when they were feeling calm. You can do your best to stay calm and stick to the plan. I find that communicating what’s going on to others can help to relieve the pressure you may feel as a parent. A simple, “thanks for calling. I’m sure her stomach is bothering her. She’s been dealing with some worries lately and often that results in a stomach ache. We made a plan for staying in school. I reminded her that she was going to take a short break and a drink of water and then get back to her classroom.” If the problem becomes a pattern, then working with the school to develop a more thorough plan may be in order. Knowing that getting through these moments is hard work for your child, you can include ways to offer comfort and support in your plan. Figuring out with your child which tools help them through these moments, and how your child would like help remembering or using those tools is important in the planning process. Additionally, praising your child for getting through the tough moment and celebrating when appropriate helps to reinforce their coping as well as strengthen your relationship. Posted in Articles, Behavior, Parenting.